The development of the automotive battery market is important for the automotive sector as batteries serve different automotive applications in alternate and conventional products. Increasing adoption of electric vehicles with favourable government initiatives including subsidies and tax rebates will encourage demand for Lithium-Ion batteries. Hybrid and plug-in hybrid electric vehicles are key application areas. Lithium-ion batteries use a cobalt-based cathode and a graphite-based anode owing to high energy density achieved by the combination. High energy density increases the power storage and can energise electronics and applications with high power requirements. Compared to other types of batteries, Lithium-Ion batteries can deliver upwards of 3.6 volts, which is three times higher. With increasing concerns over energy security and carbon emission issues, there has been a significant increase in the adoption of renewable and nuclear sources for power generation. This leads to an increased focus on more efficient and reliable energy storage and therefore, augmenting the demand for lithium-ion batteries. This Top 20 Lithium-Ion Battery Manufacturing Companies Report 2018 will keep you informed and up to date with the developments in the market. With reference to this report, it details the key investment trends in the global market, Analysis on Total Company Sales and the share of total company sales from Lithium-Ion Batteries and information on Lithium-Ion Battery Manufacturing Company Contracts / Projects / Programmes. – How is the Lithium-Ion Battery Manufacturing market evolving? – What is driving and restraining the Lithium-Ion Battery Manufacturing market dynamics? – Who are the leading players and what are their prospects for the development of Lithium-Ion Battery Manufacturing projects? – CBAK Energy Technology Inc.
– Hitachi Chemical Co., Ltd.
– Johnson Controls International Plc. – Samsung SDI Co. Ltd.
– Tianjin Lishen Battery Joint-Stock Co., Ltd. This independent 160-page report guarantees you will remain better informed than your competitors. 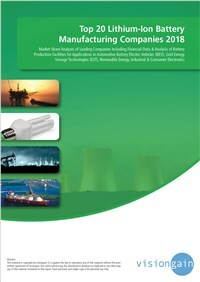 With 160 tables and figures examining the Lithium-Ion Battery Manufacturing market space, the report gives you profiles of the leading companies operating within the Lithium-Ion Battery Manufacturing market with financial analysis as well as in-depth analysis of contracts, projects and programmes. This report is essential reading for you or anyone in the Energy sector. Purchasing this report today will help you to recognise those important market opportunities and understand the possibilities there. I look forward to receiving your order. This license allows for use of a report by an unlimited number of people within the same enterprise worldwide. Each of these people may use the report on any computer, and may print out the report, but may not share the report (or any information contained therein) with any other person or persons outside of the enterprise. In the pharma sector, we also include forecast revenues for key drugs/products in the market. If relevant we also forecast company revenues coming from the indication/sector being covered. Datasets in the other sectors refers to the Excel spreadsheet that we have formulated and which details the global, regional / national and submarket data as shown within our reports. The datasets would also show our forecasts for each of the global, regional / national and submarkets over a 10 year period with detailed annual growth rates(AGR%) and compound annual growth rates (CAGR) revealed. The progression in regional , national and submarket share would also be illustrated. in some cases the datasets may also include list of significant contracts / programmes and / or product sales data.